Why is Low Moisture Carpet Cleaning a better option in Birmingham AL? Have you ever had your carpets professionally cleaned and they were sopping wet for days? Were you afraid to walk on them because you knew you were getting them dirty again right after you had them cleaned? Do you have a baby or pet and you had to keep them out of all your rooms with carpet because you did not want them to walk or crawl on a wet floor. 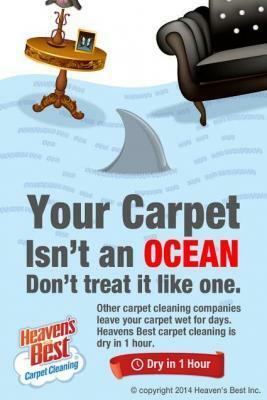 Well, we at Heaven’s Best Carpet and Upholstery Cleaning totally understand this problem. This is why we offer a low moisture carpet cleaning process that will thoroughly clean your carpets and rather than taking hours or even days to dry, your carpets will be dry in about 1 Hour. One of the reasons Heaven’s Best Carpet Cleaning was started back in 1983 was because of this problem that customers complained about. The first Heaven’s Best franchise began by using a different process that uses much less water and therefore your carpets are not soaked. Along with less water, Heaven’s Best uses environmentally safe cleaning solutions that clean extremely well, and are also safe for children, pets and elderly. After having your carpets cleaned by Heaven’s Best, you don’t have to be afraid to walk on them. We recommend waiting about 1 hour before you walk on them, but even if you have to walk on them sooner, it is ok. Along with being able to get back with your life and activities in no time, your home or office will smell great after we clean. This is because we offer FREE CITRUS DEODORIZER with all our carpet cleanings. Other carpet cleaners charge extra for deodorizer; not Heaven’s Best! We believe that when you get your carpets cleaned, you want them to look great and also smell great. You can’t beat our excellent customer service, our great rates and our Fresh Scent. Heaven’s Best offers both residential and commercial carpet, upholstery, and floor cleaning services. So, don’t wait any longer to have your home or office carpets cleaned! Call Heaven’s Best today at (205) 618-9150 to schedule your Low Moisture Carpet Cleaning in Birmingham, AL. We promise after we clean for you, you will want to tell all your friends and family about Heaven’s Best.